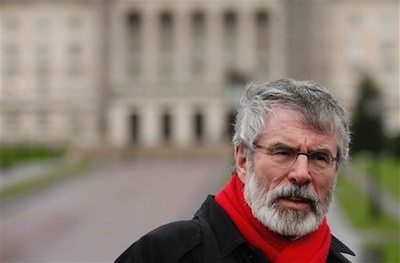 Sinn Fein leader Gerry Adams, writing for Leargas, warns that the 1998 Good Friday peace Agreement ‘hangs by a thread’. The future of the political structures created by the Good Friday Agreement hangs by a thread. In the 17 years since it was achieved the Agreement has faced many challenges but the determination of the British Tory government, and of the unionist parties, to implement swingeing austerity cuts represents the gravest threat yet to the political institutions. Last week the Sinn Fein Ard Chomhairle agreed to give conditional support to the Budget nos 2 Bill that Arlene Foster has introduced into the Assembly. It is a technical piece of legislation that gives effect to the budget which Sinn Fein and the other parties agreed during the Stormont House negotiations at Christmas time. Sinn Fein’s support for the Stormont House Agreement was based on full protection for all successful claims for social security benefits under the control of the Executive for the next six years. In February the DUP defaulted on this part of the agreement and provided only for current recipients. The Budget nos 2 bill has been described by some as a ‘fantasy’ budget. But failure last week to pass the budget bill would likely have resulted in an immediate crisis in the political institutions. The Sinn Fein decision provided a space in which solutions might still be found. However the ability of the parties to do this has been severely undermined by four years of consistent Tory cuts that have targeted public services and the most vulnerable in society. In total one and a half billion pounds has been slashed form the Executive’s budget in addition to cuts to welfare spending at Westminster. This austerity agenda has caused real hardship for many families and impacted badly on the provision of public services. Throughout this time Sinn Fein’s priorities have been to ensure the efficient functioning of the power sharing institutions; create jobs and reduce unemployment; protect the most vulnerable in society, and to bring forward working budgets that ensure the delivery of frontline services. Sinn Fein deputy First Minister, Martin McGuinness, has also played a central role in the Executive’s successful job creation strategy that has seen unemployment falling. We sought to strengthen these objectives through the negotiations at Stormont House, by working to create a coalition against Tory cuts within the Executive and wider society, and by setting out an alternative to austerity. Part of this was agreeing to the budget for 2015/2016. We agreed this budget in good faith in the context of it being a finalised budget with no further cuts, and in anticipation of the delivery of all aspects of the Stormont House Agreement. There has been limited progress on the Stormont House Agreement. The DUP is still refusing to honour the agreement on social security protection safeguards and the newly elected British government intends to impose further cuts of #25 billion to public spending. A cut of #38 million from the 2015/2016 budget in the six-counties has already been determined. Sinn Fein’s position has been consistent and clear. We are totally opposed to the Tory cuts agenda. We are opposed to it in principle and in practice. Tory cuts and austerity are incompatible with democratic values. Sinn Fein cannot and will not be agents of cuts imposed on citizens in the north at the behest of millionaires in London. Others who may be prepared to perform this role should be mindful that these cuts will affect unionist and loyalist citizens as well as everyone else. To date the most vulnerable have been cushioned from the worst of the Tory cuts to the block grant, however there are also cuts in spending by government departments that have been announced but have yet been given full effect by the voluntary and statutory agencies and bodies that have seen their funding reduced. Republicans want the political institutions to work and deliver for citizens. Despite the inevitable problems associated with a unique and experimental power sharing system there can be no doubt that the Executive and Assembly and all-Ireland institutions have worked much better for citizens than the years of direct rule by unaccountable British Ministers and the decades of one party control by the Ulster Unionist Party. Consequently our preference is for the current institutions to stay in place. But it cannot be at any price. Sinn Fein does not expect conservative governments in Dublin or London to change their political or ideological positions. They are both wedded to the austerity agenda. However, we do expect both governments to accept the special circumstances of the north, as a society coming out of conflict, and the need for an economic dividend to the necessary process of peace building and change. We also demand that they fully implement the Good Friday Agreement and subsequent agreements. Specifically, the two governments should implement those elements of the Stormont House Agreement that deal with the past and legacy issues. Victims and their families should not be prevented from achieving truth and closure because of the failure to reach agreement on other issues. The two governments can and should proceed with establishing the Historical Investigations Unit (HIU); improving Legacy inquests and establish the Independent Commission on Information Retrieval (ICIR). In the meantime Sinn Fein Ministers will continue to maintain frontline services as far as possible. And strive to protect vulnerable citizens. At this eleventh hour I would urge civic society, the business, voluntary and community sector, the churches and trade union movement to play a full and positive role in defending citizens against austerity and in defending public services and democratic political institutions. The British Tories need to be persuaded to agree a realistic funding for the Executive which delivers for citizens. Without a working budget this is not tenable.